MADRID, March 13, 2014 /PRNewswire/ — Isygames, the award-winning science and education app developer behind the popular D. Bones app, today released The Amazing Digestive Journey—an interactive learning adventure game that teaches kids about the digestive process and how it works. As users take an interactive virtual journey through the complete human digestive system, quizzes, simulation exercises, and information games engage and motivate learners to explore while they learn fundamental concepts of anatomy and physiology. 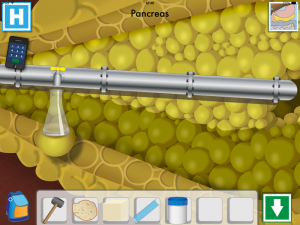 With The Amazing Digestive Journey, users easily pilot through a virtual simulation of the systems and structures of the mouth, esophagus, intestines and other organs, all depicted in detailed imagery. The user-friendly interface of the app lets kids explore and learn, while advancing to different sections at their own pace. At each stage, users can click for more information, and acquire a deeper understanding of the digestive system. Quizzes allow parents and teachers to measure learning retention. The Amazing Digestive Journey was developed with funding from a prestigious grant by the Spanish Ministry of Education, and is doctor-supervised. The app is part of an anatomical overview series of apps being developed by Isygames. In addition to the popular D. Bones skeletal system app, more apps for the heart, lungs and muscles are coming in the spring. The Amazing Digestive Journey is an ideal educational tool for parents and teachers of kids 6-14. Isygames is an educational technology developer that creates innovative and engaging science learning apps for children. A team of parents, teachers, publishers, and medical professionals, Isygames has created educational apps that are focused on rigorous content while adding playful learning games that make education more enjoyable. Ideal for classroom use, Isygames game-based learning apps include texts written by education professionals and tests for checking a learner’s progress. Isygames was founded in 2011 by Raquel Sanchez Anzola, who has over 15 years of publishing experience, including interactive design work with Microsoft Encarta. Isygames’ D. Bones app has been featured by Apple on the App Store and highlighted by Google as one of the top “75 Apps for Your Class” on Google Play for Education. The Amazing Digestive Journey is available on iTunes for $1.99. Read more news from Isygames.